Cheaper Bali Car Hire - Compare Denpasar Bali Airport rental rates for SUV, MPV & Minivan Hire. 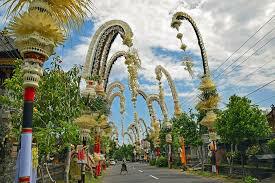 Compare cheaper Bali car hire here and save money. We can help with vehicles at Denpasar Airport, Kuta or at locations around this wonderful island. Both Avis and Europcar have discounted their usual rates, through our website, to encourage you to book early. However, they still give you the same high standard of vehicle, cover and service that you would expect from these companies. Prices come inclusive of mileage, roadside assistance and insurance. Excess protection can be bought during the booking process, to cover any damage claim. Unlimited mileage included on all vehicles, and breakdown and Collision Damage Waiver cover also included. Local insurance can reduce this to zero. If need to make a change to your rental, this can be done without charge. If need to cancel, usually this is possible until a couple of days before, but check your voucher. Everyone knows about what Bali has to offer, with it's beaches, shipwrecks, mountains, volcanoes and forestry. Most tourists make a beeline for Kuta, but if you want a more sedate lifestyle, then are plenty of places to stay dotted aroundthe island. One of the unique things to do here, is to be able to scuba dive on a shipwreck just a few yards off a beach, but for those with an aqua-lung on their back, or a snorkel on their face, the chances to swim with fishes are endless. Then there are the surfers, who ride the pipes and barrels of the coastline breakers. The island is only a mile and bit, off the east coast of Java, and west of Lombok, and if there were no tourists, there would be about 4m people here. Denpasar is the busy capital of the island and where you will find the also named, Ngurah Rai International Airport (DPS), about eight miles to the south.